Watch “Pittsford Personalities” any time online! You can watch all the episodes of “Pittsford Personalities” any time by viewing them online! 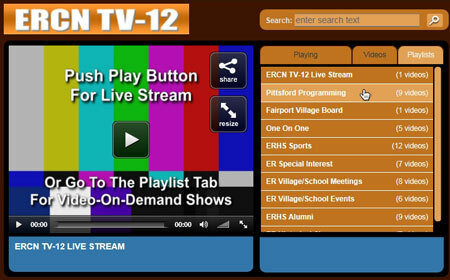 Click on the “Live Program Feed” link on the Channel 12 page of the Town website, then click the “Playlists” tab and select “Pittsford Programming” from the list. From there, select the show you would like to view. Town Historian Audrey Johnson which premiered on Pittsford’s Government Access Channel 12 in July of 2014. The program features personal interviews with long-time Pittsford residents and descendants of some of Pittsford’s founding families. The program is shown at various times on Channel 12. You can find the current schedule on the Channel 12 page of the Town website or check the “Latest News” section on the home page of the Town website for highlights regarding the current programming.